All deposits are non-refundable with the exception of inclement weather such as heavy rain, high winds or when the U.S. Coast Guard has announced that a small craft advisory is in effect. If any of the preceding should occur, you then have the choice of either receiving a complete refund or rescheduling your boat rental for another day. If you wish to cancel your rental for any other reason, your deposit will not be returned. If your plans should change, you have the choice of rescheduling your rental or applying your deposit toward any other product or service that we offer. If you must cancel, you must contact Gill Dawg Inc. within 48 hours of your reservation, for you to re-direct your deposit toward another product or future reservation. Cancellation of reservation on a holiday weekend will be forfeited entirely. Any re-directed deposits must be used/scheduled within 90 days of the cancellation. After 90 days, the deposit is forfeited. If you book multiple boats and then cancel one or more of them, the same policy as previously stated above applies. 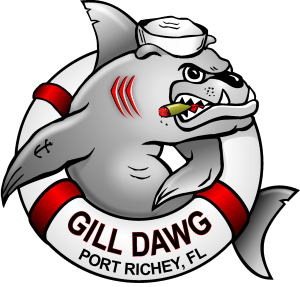 Gill Dawg, Inc. cannot apply the deposit to the booking fee on the boat(s)/PWC that you are still renting. If you are late returning a boat, you will be charged $1.00 per minute. No drinking is permitted while operating our boats. Florida law states that if your blood alcohol level is 0.08 or above, you are legally “under the influence.” If you receive a BUI (Boating under the Influence), it will be added to your permanent driving record. You must be 25 years old or older, with a valid credit card and a valid driver’s license to rent any of our motorized boats. The designated driver(s) named on your rental agreement are the only persons who may drive the motorized boats. Drivers of motorized boats must be at least 25 years of age, with valid driver’s license, to operate any motorized Gill Dawg boat. No exceptions will be made to this policy. Anyone born after January 1, 1988 who operates a vessel powered by 10 horsepower or more must pass an approved boater safety course and have in his/her possession photographic identification and a boating safety education identification card issued by the Florida Fish and Wildlife Conservation Commission. The following operators are exempt: A person licensed by the U.S. Coast Guard as a master of a vessel. Motorized boats will only be cruised at 3/4 throttle, as this is better for the engine. No skiing, tubing or towing of other boats or persons in the water-No exceptions. No mooring at docks other than our own, unless prior permission has been obtained and written into your contract. Boat operators must stay between the channel markers at all times while in a marked channel. Remember: RED, RIGHT, RETURN. If you cross a channel, you must cross perpendicular and it must be at a marker. Consider the channel to be about 60’ wide. IMPORTANT SAFETY INFORMATION!! Non-motorized boats may only cross the channel and should always cross as a group when applicable. Non-motorized boats SHALL NOT be operated in the channel unless you are crossing, in which case, you must cross quickly when there is no traffic. Boat operators must obey No Wake Zones at all times. If Gill Dawg, Inc. receives a third party complaint that you have broken this rule; you will be fined $150.00, which will be billed to your credit card. The designated No Wake Zone is from our docks to the end of the channels designated No Wake Zone (Signs will clearly indicate when you can run with a wake). We also require no wake when you are within 200 feet of any anchored vessel or island beach. If you violate this rule, the City may shut down our entire operation! Gill Dawg, Inc. does not offer insurance on any of our boat/PWC rentals. This means that you, as the person named in the boat/PWC rental contract, are responsible for your boat/PWC, its motor and equipment, and your passengers. If the boat is not returned to our docks in the same condition as it was when it left, your credit card will be charged for any applicable repairs. When trimming up the engine in a boat, do not permit the propeller to come out of the water when the engine is on. This will cause you to lose steering ability and will damage the engine as it will over heat. Boat operators must stay at least one mile from the mainland shoreline. For boat renters, please watch the boat depth sounder and when it reads three feet or less, reduce your speed and proceed with caution. If you damage the propeller, Gill Dawg, Inc. will charge your credit card $175.00 for a replacement prop. Please slow down if a larger boat approaches your boat in the channel, as its wake could flood your boat. Boat/PWC operators must stay away from the Styrofoam balls and other buoys. These are crab traps and they can damage your boat propeller. Please also note that disturbance of a crab trap or retrieval of the crabs contained therein is against the law and carries a $5,000.00 fine in the State of Florida. If a storm rolls in, please call Gill Dawg, Inc. for instructions on how to proceed, and then make sure the boat is anchored solidly. Take shelter under the canopy. Do not try to return to Gill Dawg’s dock during a storm under any circumstances. Do not beach your boat. Set your anchor(s) and make sure that the boat is floating at all times. As the tide rolls out, you must move the boat out with it. 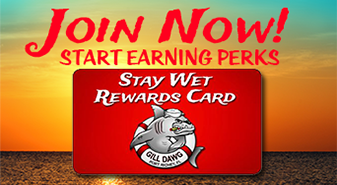 If the boat is beached on an outgoing tide, Gill Dawg, Inc. will charge your credit card $250.00 for our personnel to pick up your party and to stay with the boat until the next tide comes in. Rinse the mud off of the anchors before stowing them on board the boat. If you tie knots in the anchor line, untie them before you get to the dock. Failure to do either of these items means that our personnel will have to do them, which in turn means an additional charge to you. If you get lost, call Gill Dawg, Inc. immediately for directions. Our personnel will instruct you on how to get back. Do not call the U.S. Coast Guard for any reason unless you are unable to contact Gill Dawg, Inc. via cell phone and/or it is a life-threatening emergency. If your boat does not start, call us right way, as most problems can be dealt with over the phone. If we are unable to get the boat up and running again in this manner, Gill Dawg will dispatch our personnel to pick up your boating party. If, it is discovered that you or someone in your party caused the problem, your credit card will be charged $50.00 per hour. Please balance the passengers on the boat so that it does not list to one side or ride bow down in the water. Passengers are forbidden from diving or jumping off the boat while in motion. No bow riding is allowed while the boat is moving. All passengers must remain inside the railings as per Florida state law. All passengers must board the boat at the Gill Dawg, Inc. docks. Picking up additional passengers at other locations during the rental is prohibited. Florida law states that all children age six and under must wear a life jacket at all times while on the boat and EVERYONE (Regardless of age) while operating a PWC. Even if your boat rental includes a boat captain, please note that you are still responsible for any damages that may occur to the boat by your party, with the exception of those that occur as a direct result of operation of the boat captain. Any repairs to or replacement of any boat components will result in a charge to your credit card by Gill Dawg, Inc.
You must have a fully charged cell phone placed in a waterproof container on board the boat. The phone must remain on for the duration of your excursion. No fires or grilling are allowed on board our boats. Your party may bring a grill to cook out off the boat only. LIABILITY AGREEMENT: I, the Renter(s), hereby release from any legal liability, the Owner(s) and Agent(s) from any and all liability for damage and injury or death to myself and or any person or property resulting from the selection, maintenance, or use of this equipment, and for any claim based upon negligence, breach of warranty, contract, claim, or other legal theory, accepting myself, the Renter(s), the full responsibility for any and all such damages or injury which may result. It is understood and agreed that the Rental Fee is a presently earned fee for the use of the equipment and that the Security Deposit is a deposit against costs of repairs or cleaning that may be required as a result of physical damage to the equipment during the rental period or against any liability that I may incur to Owner(s) pursuant to this agreement. Further, I, the Renter(s) am responsible for all damages and/or losses to the equipment or any of it’s contents during that period. Owner(s) or it’s Agent(s) reserves the right to (a) authorize the use of the equipment and (b) revoke the use of the equipment. Decisions on the part of the Owner(s) or it’s Agent(s) with regard to the use of the equipment by RENTER(S) are made for safety reasons, including, but not limited to, the following: (1) Unsafe Operation of Equipment, (2) Lack of sobriety of the RENTER(S), (3) Unsafe Weather ConditionsJURISDICTION: Parties agree that any disputes arising out of this agreement may only be brought before courts of Pasco County, Florida.